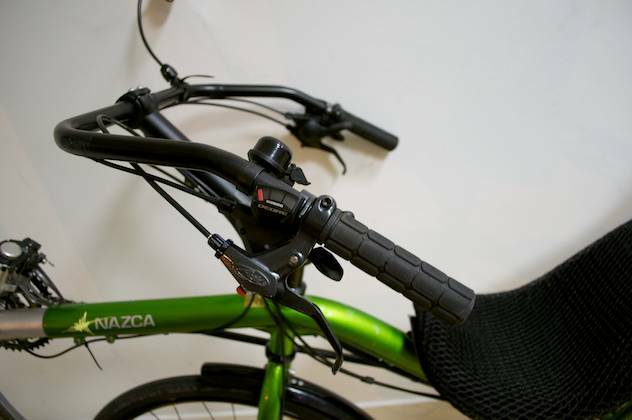 This lovely apple-green Gaucho 26″ came through the Laid-Back-Bikes showroom recently, and I was able to steal a (short!) test ride as well as a handful of pictures. 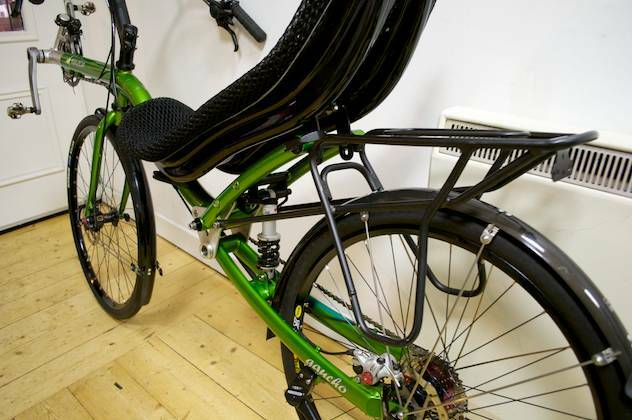 The highlight of this model are the twin 26″ wheels (robust, with a fantastic choice of tyres) which combine with the s-bend frame, delivering a relatively low ride height. I had no problem getting my feet flat on the floor while riding, which is really key for comfort and utility when you want to ride with a load and/or on “interesting” surfaces! This model is currently equipped with the excellent Schwalbe Kojak tyre, but there is enough clearance for a more rugged touring model, or even a light off-roader. The open-cockpit handlebars won’t suit all tastes. To my surprise, I found the handling was quite nice, even turning relatively tightly. Perhaps my riding skills are just getting a bit better! Although initially skeptical, I was really won over by this charming and versatile design in the short time I spent with it. Not the lightest, or as rapid as the Fuego or the Gaucho 28″, but robust and really pleasing to ride. I can vouch for this bikes load carrying capacity. I did 800 miles through Netherlands, Belgium and France carrying a full camping load on it. The load was carried in four Ortlieb panniers. Never a hint of instability or unwelcome flex. Handling was secure and stable at all times. A great bike. I should have added. The open cockpit type bars are, in my view, unbeatable in touring situations. They give such precise control while riding. Handling and moving a heavily laden bike when dismounted is made so much easier. I kinda prefer tiller type steering in all normal riding situations but they are not as good as open cockpit once you have a load on. Thanks for the comments, John.. I was hoping you might stumble upon this! As you’ll have gathered from my Corsa write-up, I’m not a big fan of OC bars. However, I had to master them to ride the Quetzal tandem (I think perhaps it was mainly something about the Bacchetta setup I didn’t like – or maybe it was just insufficient experience). I did like the handling of this Gaucho a lot. It was more responsive than I expected but felt really well balanced – I can imagine it would be great with a heavy load. Like you, Dave, I found the Bacchetta system less than ideal. My Corsa (with the narrow ‘tweener’ bars) was poor – obviously designed for fast straight roads and open bends. The steep spiral ramps on my cycle paths were a ‘challenge’! The Giro 26 was better (wider) but the almost straight armed riding position meant less control than I would have liked. The Gaucho bars are wider at the grips and come further back toward you meaning the slow speed, bigger, steering movements can be made in complete control. I was never conscious of the bars hampering me in 99% of circumstances. Only when doing a U turn in the bikes own length did I drop a leg. Hi Roger – is that 80km each way, or 80km round trip? (Either way… that’s a long way especially in the Peak District!). Do check in to let us know how you’re getting on! @John, thanks for the extra info. It’s interesting that you have the same opinion with obviously a much greater mileage for the comparison. I did wonder if I was selling the Corsa short (perhaps I was just surprised to find a bike I didn’t like!). What have you moved onto now the Gaucho has a proud new owner? Or were you consolidating? Hi Dave. The lads (DF riders) I ride with and I decided we would go down the lightweight touring route using BB’s and Hostels. That combined with a weekend riding the ‘your’ Gaucho 28 last summer persuaded me that it would see more use than the 26 yet still be capable of a light touring trip. So, I am waiting on a Gaucho 28 arriving in the next couple of weeks. Between my Sprint 26, MTB, DF Tourer, Fuego and Gaucho I’ve got a bike for just about every type of riding I do. I should consolidate really but rely on keeping Elaine (my partner) from seeing inside my workshop!! 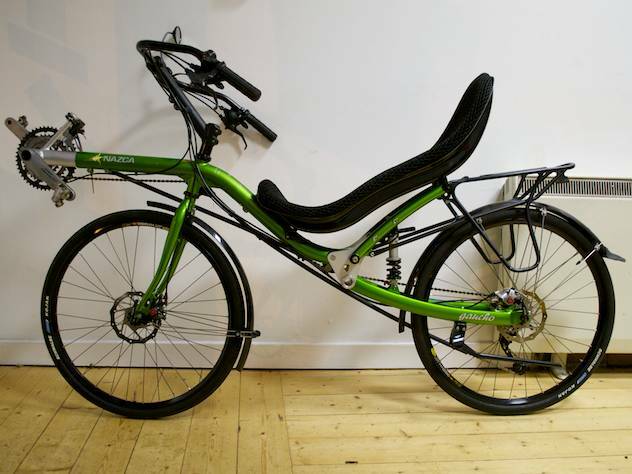 I hope I’m not being unfair to the Corsa – it had some fine qualities – of the recumbents I have owned it has been very stable and the most responsive. The only one you could accelerate like a DF racer. I suspect that if the riding position suits you then it is a great bike but if not then using seat adjustment to achieve fit does all sorts of peculiar things to the handling and feel of the bike. Gaucho 28 is certainly capable of touring although with the narrower tyres you’d need to be a little careful on rough surfaces. Would be significantly more rapid than the 26 with the right rubber. If only my legs were longer! I found the 26 when I tried it at Laid Back Bikes just a little too high such that I had discomfort when stopped and getting my feet on the ground. So I guess the faster 28 would be out of the question, but David at Laid Back has suggested the Gaucho in 24″. Alternatively there’s the Pioneer in 26 which has a lower seat than the Gaucho. What effect would the smaller wheels have on it? David says it would be more nimble. Looking around at reviews it seems that larger wheels roll better, but accelerate slower? But once you’re moving that easy rolling is good. I ride mostly tarmac, sometimes the softer Sustrans routes. The tarmac here isn’t a smooth as it could be. I’ve had a 20″ wheeled trike sink in shale once, but only once in a lot of riding. The larger the wheels the easier the bike rolls. However, the handling often gets much better as you reduce wheel size – I’m not sure I’ve ridden a Gaucho 24″, but I did spend quite a lot of time with a Furai on those size wheels, and thought they were a great compromise. It was a very manoeuvrable bike, in contrast to my High Baron, which is fine on the road but often defeated by Sustrans! Unfortunately I’ve never seen the Pioneer, so I can’t help you make a direct comparison. All the Nazca bikes I have ridden have been great. I found as the seat got lower the bike became more twitchy. Maybe this is the increased manoeuvrability. The seat height on the Gaucho is actually apparently lower than that on the Street Machine which I did find I could fit, so I wonder if I should have looked for seat adjustments on the Gaucho. 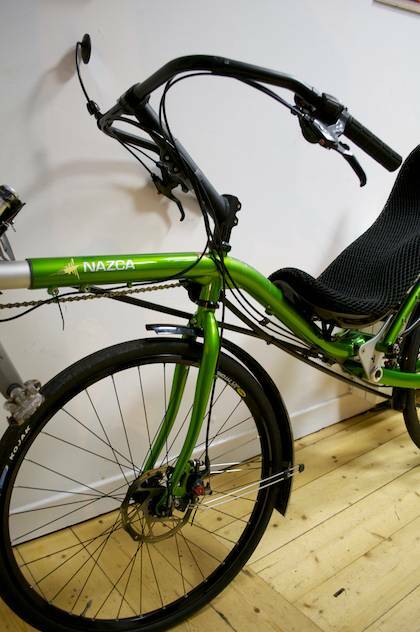 Nazca’s web site talks of ability to adjust height through suspension settings. Street Machine was more comfortable at the stops with its seat more upright, with the notion on their web site “you can set the seat lower for longer country rides” making sense. Looking at the pictures on your site the front nose of Gaucho’s seat, which was the bit causing interference for me, is screwed to the frame and fixed. I have prostatitis so that’s one point I can’t comfortably take pressure and am told to avoid prolonged pressure there. Street machine felt lighter, but that may have been in some way because you see those oversized tubes and think “this will weigh a ton – oh it doesn’t”. I wonder if their 14.5kg is without racks and mudguards, and Nazcas’s 18kg is with standard equipment – racks and mudguards – and if it all makes much difference when I add 76kg of me and 2kg of D-lock plus any luggage. I never found out how well the small wheel would work on Sustrans’ unpaved tracks. In some ways I think a decision would come down to do I want a tourer or faster bike? I already have a trike which can tour. 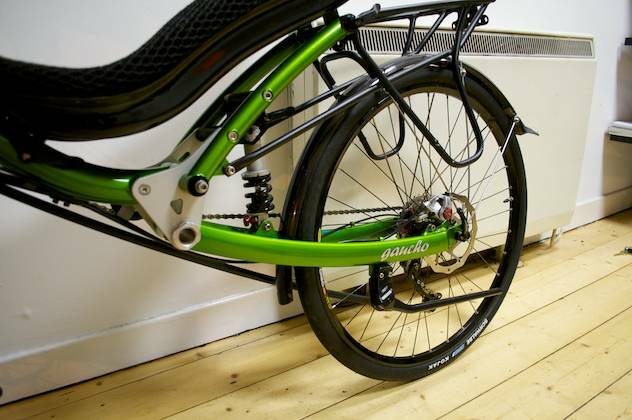 Maybe I should have looked at the Fuego too – Nazca’s sportier bike with the 20″ front wheel. I believe that the seat height on the Gaucho 28 is 2 cm lower than the 26. Having said that I really appreciate the lower bb height of the Fuego. Launching it in any circumstance quickly becomes second nature. Having not got on with tiller steering, if I were to try the Fuego I’d have to try the Aero-steer. It seems to give a similar long arm position to under-seat steering, but higher up rather than down by your sides. An interesting compromise? Reading a few reviews of the Fuego, it seems a well respected bike. I see what you mean about the seat heights. Though the Gaucho Touring 28 is at 64cm, above the 62 of the Tour 26 and the 60 of the Racing 28. Nazca recommend the 28 racer for riders above 175cm so not me. (Though I have an old 700C cross bike I could ‘borrow’ parts from if I were to go that route). Interesting how presumably just the different components make such a weight difference – if it’s the same frame as the Gaucho Tour. Richard, that appears to be the case. I did consider building a ‘light’ Gaucho 26 at one point. The other big wheeled bike that will do swift roadwork and light touring is the Furai 26. Low seat height and lightish weight. Its an SL frame though and I wouldn’t want to use one on a heavy weight rough road tour. That unguarded pulley on the Furai 24 really interfered with my leg. Pity as it was otherwise a good bike.